If you own a Fjord mare and are considering breeding her, then you are a breeder. You might think that in order to be a breeder you have to have lots of mares – or at least a certain number of mares – and maybe you even need to own a stallion. That is not so. The technical definition of a breeder is the owner of the mare at the time of service. It is not the number of mares or the size of your operation that makes you a breeder. A trainer friend of mine tells a story about a local farmer who used to import young Warmblood horses from Germany, raise them, and have her train them for dressage. His goal was to sell them for profit, which — with the realities of horse business — was elusive. Then my friend said to him “This time don’t get six colts. Get one. But make it a really good one.” That one really good colt, with their efforts focused on him, went on to represent our country in International competition and to eventually be sold for quite a tidy sum. So, it is not the numbers that define the success of your venture – and the person who breeds one mare has just as much chance as any breeder of producing that one really good offspring. Before you start, you need to know what your goal is when you breed your mare. What are you trying to produce? How will you know if what your mare has produced is a really good offspring, and what purpose do you hope that offspring will fill? Of course we all hope that the foals we produce — being ours after all — will be more special than all the rest and will go on to lead happy lives of useful service. The reality is that we are going to be adding one more animal to a world in which many animals are already being auctioned off for meat, being starved, or being abused or neglected. So any discussion of breeding needs to start with a sane and sober look at what your goal and motivation is in breeding, what you hope to produce, and what tools exist to help you reach that goal. Perhaps you are interested in breeding to obtain a replacement for a treasured mare who has been a good performer for you and who is not getting any younger. Or maybe you desire the personal challenge of breeding Fjords to train and market for participation in your area of interest, be it combined driving, dressage, draft work, or numerous other areas. 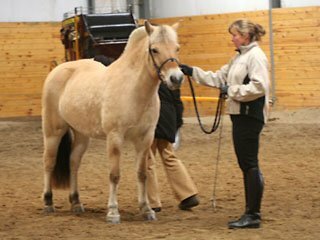 Since most Fjord purchasers are amateurs (non-professionals) — as are most Fjord breeders — if you can demonstrate that Fjords of your breeding can achieve success for an amateur in your sport, you should have a market in people who would enjoy doing similar. Give the kids a life-lesson: While this seems an admirable sentiment, bringing a foal up to be a mannerly citizen requires time, attention, knowledge, and self-discipline. 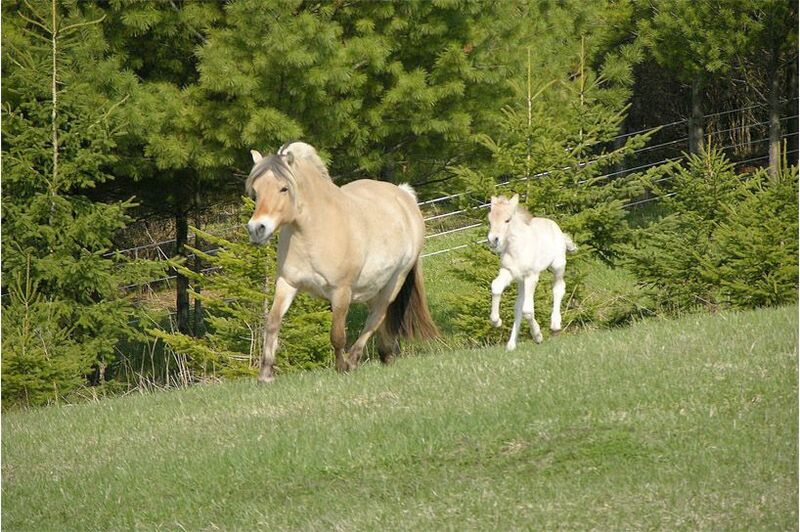 Fjord foals are unbelievably cute but it is critical to their future development that they not be treated like the stuffed play-toys which they resemble. Most experienced horseman would rather train a three year old that had grown up ‘wild’ in the field with other horses, than a horse that had been allowed or encouraged as a foal to exhibit bratty and disrespectful behaviour towards people. Have fun: While having a foal around can indeed be a source of joy, remember that having baby horses is also a great deal of work, a continuous responsibility, and carries with it the potential for huge disappointment. Save money: Buying a made horse is almost always cheaper than breeding, raising, and training one, especially if you have to pay for the training; and when you buy, you get to see what you are getting in advance. Make money: While it is not impossible to make money with horses, the upfront investment plus the amount of work you need to put in will average out to a very low hourly wage indeed. This means you need to possess a burning passion for what you are doing. Furthermore, sufficient personal resources must be available to support all your animals through downturns in the market, health problems, accidents, and the myriad unforeseen expenses that can arise. While it is the stallions that get the most press in the breeding equation, breeders have long suspected that the mare has more influence on the offspring. Certainly, in the formative months after birth, the foal will take on many characteristics of the mare’s behaviour. Recent studies into maternal mitochondria seem to have given some scientific validation to breeder’s instincts. While the impact of the research is still being debated, the experience of top sport horse breeders should help shed light on why all breeders should spend extra time, effort and care when it comes to choosing just the right mare to breed. Hermann Meyer, a prominent Hanoverian breeder in Germany, and breeder of more than 50 approved stallions, says “The mare isn’t the only one who passes on her qualities. Her lineage – usually up to the sixth generation – is passed on as well”. This comment should not be interpreted as a license to breed your nice mare to ‘any old’ stallion, but rather it serves to underscore the importance of determining whether your mare has qualities that are worth reproducing. The mare owner, as the breeder, has an important role indeed in the stewardship of our breed. Literally dozens of volumes exist for Thoroughbred breeders which discuss the pedigrees of families and attempt to identify the “nicks”: crosses of animals from certain families which seem to predictably produce offspring of consistent quality and athletic ability. Fjord breeders have access to little such information and yet, perhaps, realizing our breeding goals is an even bigger challenge. This is because rather than trying to produce an animal which excels in one category, such as the speed of a race horse, we wish to produce an excellent all-around animal. The good Fjord must be a good example of his breed, that is, he must have good breed type and character. His conformation must be functional and his use versatile. We wish him to have a temperament which is trainable and allows him to be used by many types of owners, while retaining the sparkle which gives him the presence of a true Fjordhorse. In the Norges Fjordhestlag breeding plan document, the first sentence under breeding goals says: “The Fjordhorse shall possess the character which is typical for the breed.” They go on to say that what is characteristic of the breed is very difficult to define in words and certainly can’t be measured scientifically, “it is more like a feeling that you have”. Developing an eye for a horse, and this “feeling” for the Fjordhorse in particular, is a process that takes time, training, and exposure to many animals. Attendance at domestic and international shows and evaluations is a good way to gain exposure to a number of horses and compare your perceptions of their qualities to those of the trained judges/evaluators. Many Fjord-breeding countries have evaluation systems. While the details of each system vary (and under the direction of Fjordhorse International, the systems may move more towards standardization) the goals and the raison d’etre of each system are similar, namely: to identify the qualities that the horse possesses; to identify his strong points and his weak points; to provide guidance to the breeder in identifying those horses who are of sufficient overall quality to be breeding candidates; to provide information which will help in selecting the best possible matings; and to provide feedback on the success and/or failure of the breeding program to date. The information derived becomes one tool in the breeder’s toolbox for making future breeding decisions. In some countries, the end result of the evaluation system is that the horse receives a breeding license, or not. In addition, some countries require horses to return periodically to be re-inspected, and to have the results of their offspring inspected, in order to retain their license to breed. In North America, the evaluation system is voluntary and horses do not require a breeding license in order to be bred. The North American Fjordhorse gene pool includes a number of Fjordhorses imported from other countries, where they have been evaluated under that country’s evaluation system, so it is important to the breeder to understand the evaluation results from other countries in addition to the NFHR system. Key to your understanding of all systems is to remember that the goal of an evaluation system is not to rank horses or to compare the horses to each other. 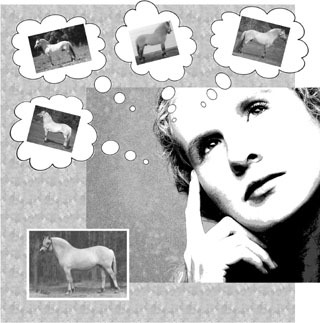 The goal is to identify each horse’s qualities in relation to the breed standard. Scott Hassler, Training Director at Hilltop Farm, a Maryland breeding farm which stands a large number of successful Warmblood stallions, says that when seeking out a stallion to breed to, “the final numeric scores for a stallion should not be your basis of comparison, especially when the stallions have been evaluated at different times. More important than the final number are his scores (on a scale of 1 to 10) in the test’s various components”. Indeed, small differences in final numeric scores are not mathematically significant and should never be used to rank or compare horses. It does not make sense to say, based on the final score, that this horse is best, this one is second best, and so on. In the evaluation scoring system, the numbers are being used to represent concepts, and arithmetic doesn’t work particularly well on concepts. Accordingly, it is important not to get hung up on the final numbers, and it makes no sense to talk about a “highest-point” horse. The strength of the system is the information that is derived from the horse’s scores in each individual category, as well as the judges’ comments on the horse’s traits, both in each category and the overall comments. This information will give you a picture of the horse’s strengths and weak areas. From here you can begin to look for ways to improve on the mare through the foal. You should first look for a stallion who does not share the same weaknesses or faults as your mare, but not for an extreme opposite. As a trivial example, an owner of a toed-in mare would not breed her to a toed-out stallion hoping that the foal will have straight legs. In that case, look for a stallion that has solidly ‘good’ legs which are straight in each direction. But your best chance for success comes when your mare is not too far from your hoped-for ideal, with any deviations from correct being mild. A more complex example is the owner of a mare who is fine-boned and fine-built breeding her to a stallion of extreme draft build, hoping to add more substance to the foal. The wish obviously is a for happy melding of their best characteristics, but be aware that you could instead get a conglomeration of their worst. A better choice for that light-boned and light-built mare is a stallion who is just over the median towards the heavy side. You aren’t going to be able to make huge changes in one mating so the closer to the hoped-for result that you are starting, the better. To make things more challenging, don’t forget that movement and temperament are traits that can be difficult to evaluate, especially within the context of 15 minutes on the triangle. In addition, the canter is not scored at all in the conformation/movement section of the NFHR evaluation, only in the ridden tests. These facts put more onus on you the mare owner to investigate further, perhaps by scheduling a visit to see the stallion in person, viewing a video of him moving at liberty and at work in all three gaits, and hopefully by seeing some of his offspring. Does he really possess AND pass-on the traits you are hoping to incorporate in your breeding program? Real life is always going to throw us some curve balls, and genetics on the hoof does not always measure up to genetics in theory. In fact, it has been said that a breeder requires the soul of a riverboat gambler. Probably true, but the smart player will make an effort to stack the deck in his favour by using all the tools at his disposal. Furthering your own education as a judge of conformation, breed type and movement, and as a trainer and user of Fjordhorses, will be one of the best investments you can make in the success of your breeding endeavours. Good luck in producing that really good foal! A commitment to continuing education for themselves. Trying to ensure that the mares they use are of highest possible quality. Trying to ensure the mare and stallion are a good match for each other. A good idea of why they are breeding and what they are breeding for. A commitment to correctly train and use their horses. A deep understanding of breed type and conformation or desire to learn same. An interest in finding 'nicks': families which, when crossed, seem to produce offspring of predictably high quality. Enough self-criticism and knowledge to be able to judge the strengths and weaknesses of your own breeding-stock and young-stock.